With Christmas Day almost upon us, we wanted to wish you a very Merry Christmas and a Happy New Year. 2018 has been another fantastic year for us at Check 4 Houses thanks to our lovely clients in Fleet, Farnborough, Frimley, Mytchett, Aldershot, Maidenhead and beyond. Over the past 12 months, we have saved our clients an amazing £230,000 when compared to standard agency fees. That’s an average of over £5,900 per sale. What would you do with the extra £6,000? It would certainly make a big difference towards your new home. One of our highlights of the year was our fastest sale where our clients managed to complete within just 28 days of accepting an offer. Given that one in three house sales collapse within three weeks, and that many sales that do succeed can drag on for months, that’s a fantastic achievement. It just shows the importance of using the right agent, to find the right buyer. That’s something we pride ourselves on. We do our homework to ensure we present the best buyers and manage sales closely through to completion. At Check 4 Houses we are passionate about delivering exceptional levels of customer service, which has earnt us a place in the Best Estate Agent Guide 2019. Even though we do not do lettings, this year we actually ended up sourcing a short term let for a prospective buyer. This enabled us to keep a buyers sale on track. The buyer was able to relocate the area and the ongoing chain remained intact. “Many thanks to Paul and all his staff for a job well done! From the outset, Paul was frank and honest about the market conditions and the value of my home. We agreed to market the property using ‘offers in excess of’ and within a week I had 13 viewings and several offers including several over the asking price! Check 4 Houses were always attentive and extremely professional! Of course, Brexit is coming and people are worried about all sorts of things from holidays to our harbour ports. We don’t know yet exactly what effect it will have on the property market. But we do know, Brexit or not, that people still need to move home. Be it new jobs, new partners, new babies, new schools or simply new surroundings, people will always want to move house, whatever happens to property prices. We also know that our local area around Fleet, Farnborough and Aldershot is a highly desirable area. Good commuter services to London and access to the motorway network are major plus points. We have a low crime rate, good schools, a wide variety of sports facilities and stunning green spaces to enjoy. Demand is still likely to outstrip supply. After such a busy year we will be taking a few days off over Christmas and New Year. Our offices are now closed and will reopen on Thursday 3rd January at 9 am. If you are thinking about selling your home in 2019 then please give us a call on 01252 819725. We would be delighted to give you a free valuation as well as talk you through our competitive pricing options, personal service and price match guarantee. Merry Christmas and a Happy New Year from all of us at Check 4 Houses. 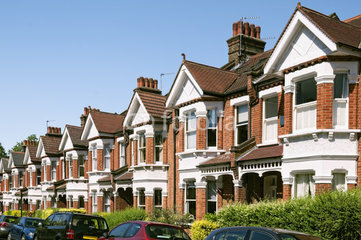 Earlier this month the Housing Secretary Sajid Javid announced plans to regulate estate agents and implement new measures to assist the property buying and selling process. At Check 4 Houses we welcome these plans. Our founder, Paul Hemmings, launched Check 4 Houses back in 2010. Paul recognised the notorious behaviour of some high street estate agents that complicated the house selling process. He wanted to create a professional, flexible and reliable service for customers that was as stress-free as possible; with a personal approach and a cost-effective pricing package. Under the new measures, all estate agents will be required to hold a professional qualification. Currently, anyone can set themselves up as an estate agent. This puts the public at risk from unscrupulous individuals. These changes should ensure that you can trust your property sale or purchase to an individual who is trained for the job, just as you would a surveyor or solicitor. 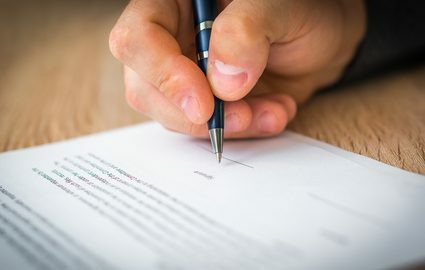 Estate agents will also have to be transparent about the fees they receive for referring clients to solicitors, surveyors and mortgage brokers. The Government also announced plans to improve the house buying and selling process through shortening delays and reducing stress. Measures include the use of voluntary reservation agreements to help prevent sales falling through and setting timelines for local authority searches so buyers get the information they need within 10 days. 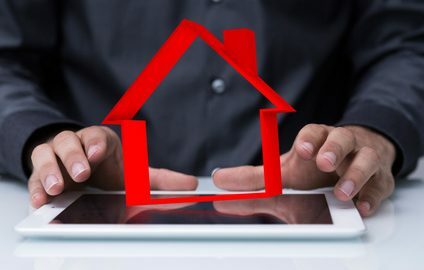 The Government is also setting up a working group to look at ways of speeding up the home buying and selling process by moving some of it online. Another working group will look at introducing new measures to compare conveyancers, to help you make an informed choice. From our head office in Fleet we sell properties in Fleet, Farnborough, Aldershot, Basingstoke, Camberley, Yateley, Farnham and beyond. We can sell your home from just £599 or 0.5% +VAT – saving you thousands in agency fees. Please give us a call on 01252 819725 or contact us and we would be delighted to give you a free, no obligation valuation of your property. When you come to buy or sell a property, you will need a solicitor or conveyancer. They will complete the conveyancing process on your behalf. But what do they actually do? What does conveyancing actually mean? Conveyancing is the legal process of transferring home ownership from one person or company to another. In conveyancing, the property is legally transferred from the buyer to the seller, or vice versa. In this guide we will look at the key steps involved. The process is similar if you are buying or selling, but we will focus on buying a property in this article. Once you have had an offer accepted on a property you will need to find a solicitor or conveyancer to complete the legal process on your behalf. It helps speed up the process if you have already decided which one you will use. You can do this as soon as you start house hunting, then formally instruct them to start work once you have had an offer agreed. Your conveyancer will request draft contracts and other documents from your sellers. You will need to go through these forms which provide further detail on the property you are buying, as well as what the buyers are planning to leave behind etc. Searches will be carried out to give you a full picture of external factors that might affect the property you want to buy. For example, are there plans to build a new motorway just across the road? Searches cover this kind of information as well as flooding and subsidence risks. Data on water and drainage which may be important if you are planning any building works. Your solicitor will write to you with details of all the search results and highlight any areas of concern. You can then address any of these issues with the sellers as appropriate. Once you are ready to proceed, you will confirm a completion date and sign the draft contract. You must also pay the deposit into your solicitors account. Once you and the seller have agreed, your solicitors or conveyancers will exchange contracts on your behalf. This is usually done by both solicitors/conveyancers making sure the contracts are identical. They then immediately send them to one another in the post. Remember, once you have exchanged contracts you are now in a legally binding contract to buy the property. You can no longer change your mind or renegotiate, without risk of being sued. Completion day arrives! The day you have been waiting for is here. Usually you collect a set of keys from the estate agent, once they have confirmed that the purchase has been completed and the sellers have vacated. Your solicitor or conveyancer pays the outstanding balance to the sellers’ solicitor, along with any mortgage funds. Your solicitor hands over the legal documents that prove that ownership has now been transferred and the process is complete. You can find out more about what to expect from the conveyancing process and how to find a solicitor or conveyancer from websites such as The Money Advice Service or The Home Owners Alliance. At Check 4 Houses we are passionate about supporting people through the sometimes stressful challenge of purchasing a property. We offer personal contact from start to finish, from local property experts. We know the towns and cities of Fleet, Farnborough, Aldershot, Basingstoke, Camberley, Yateley and Farnham inside out. Our internet based approach means we can sell your home from just £599 or 0.5% +VAT. This could save you thousands in agency fees. Please give us a call for a no obligation valuation of your home on 01252 819725 or email info@check4houses.co.uk. Survey or Homebuyers Report: Do I need one and if so, which? When buying a property you will probably think about having some kind of survey done. In most cases you will have to organise your own survey. 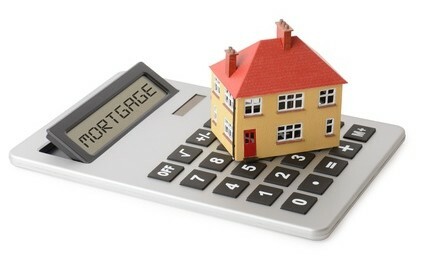 Your mortgage company may complete a valuation. However you may wish to organise a survey as well for your own peace of mind. So what is a survey? According to RICS, the professional body that represents Surveyors, A Home Survey is an in-depth visual inspection of a property. At the end of inspection, the surveyor produces a report. This provides an expert account of the property’s condition and highlights any problems. If using a RICS Surveyor, the report communicates these in clear and easy to understand ‘traffic light’ ratings. A Home Condition Report: The simplest (and cheapest) of the options, this report describes the condition of the property. It identifies any risks and potential legal issues and highlights any urgent defects. It is most suitable for conventional or unmodified properties and new homes. These are less likely to have significant issues. A Home Buyers report (may include a valuation): This mid-range option is most suitable for conventional properties which are in reasonable condition. It gives more detailed information than a Home Condition Report about the current state of the property and any remedial works required or issues to be aware of. It can include a valuation for mortgage and insurance purposes (though be aware this may be done separately by your mortgage provider). A Building Survey: This is the most expensive option – but the most comprehensive. It is particularly useful for larger or older properties or if you are planning to do substantial work to a property. The survey provides an in-depth evaluation of the current property condition. It includes advice on any issues that need to be addressed or repairs that are required. For most of us, property is the biggest investment we will ever make. Whether you plan to live in a property or rent it out, you still want to be aware of any potential issues before you part with your hard-earned money. A survey delivers expert advice on the condition of the property. This enables you to make an informed choice. It helps to ensure that your dream home does not become a disaster. You can find out more about the importance of surveys and the different types available on the RICS website http://www.rics.org/uk/. Their online tool enables you to search for registered surveyors in your local area. You could also ask for recommendations from your estate agent or solicitor. At Check 4 Houses we are passionate about supporting people through the sometimes stressful and emotional challenge of purchasing a property. We offer personal contact from start to finish. As local property experts we know the towns and cities of Fleet, Farnborough, Aldershot, Basingstoke, Camberley, Yateley and Farnham inside out. Our internet based approach means we can sell your home from just £599 or 0.5% +VAT – saving you thousands in agency fees. Please give us a call for a no obligation valuation of your home on 01252 819725 or email info@check4houses.co.uk. Is the property market stagnating or actually accelerating? News out today suggests that the property market is stagnating. 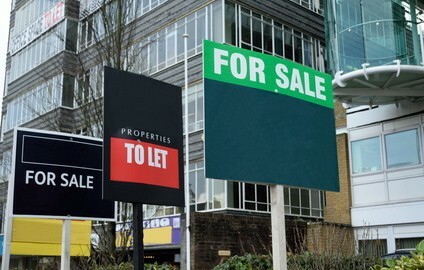 The Royal Institution of Chartered Surveyors (Rics) report says that the number of people interested in buying a property – and the number of sales – was “stagnant” in March. The headline paints a somewhat gloomy picture. But read further and the latest monthly survey shows that stock levels in the property market are at a new record low and because of the shortage of housing, prices in many parts of the UK are continuing to accelerate. So what does all this mean? 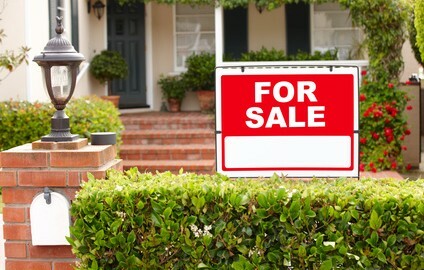 Is it a good or bad time to be thinking about selling your property and moving home? Most people move house not just because it might be a ‘good time’ for the property market, but because they need to. New babies arriving, families moving in together, people downsizing for retirement or sadly moving on due to family loss, all of these are common reasons for buying and selling property. Yet it is true also that some people can put off the idea of moving if they worry about what the market is doing and whether they will be able to get a good enough price for their home, or secure a new property for what they can afford. Whatever your reason for moving, a lack of supply in the property market can actually be a good thing. It can make it the perfect time to sell. A lack of housing stock, as we face in our local area, means that prices are continuing to rise, with more buyers looking than properties available. Particularly if you have found the property you want, you may be able to capitalise on the market and get more for your property than you might expect. Please contact us for a free, no obligation valuation on your home on 01252 819725 or info@check4houses.co.uk. We would be delighted to help. New Year’s resolutions: Buying a new home? 2017 is finally here. Christmas celebrations are behind us and January is in full swing. Are you feeling enthused and persevering with the first few days of new year’s resolutions? You might have chosen to give up smoking or drinking alcohol. Perhaps you resolved to eat more healthily, or make other lifestyle changes such as looking for a new job. Buying a new home could even be on your agenda. Are you looking for more space for your growing family? Or to relocate for employment reasons? 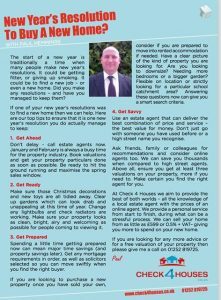 If you are looking for a new home in 2017 then we have four top tips to help you ensure it is one new year’s resolution you actually manage to keep. Our suggestions will help you get your existing property ready for sale and on the market as quickly as possible, in the most cost effective way. 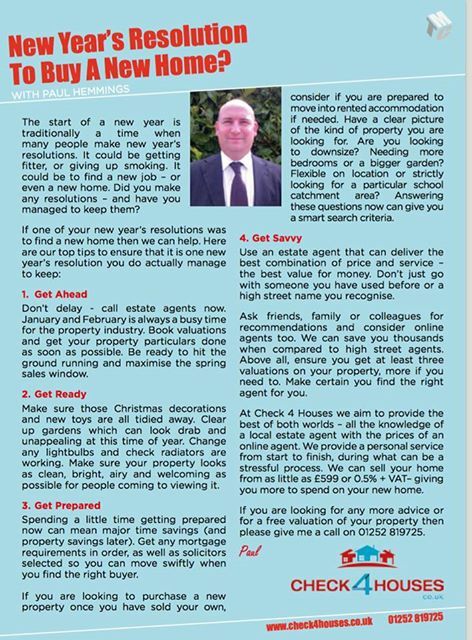 These tips are published in the latest issues of handy local guides Farnborough and Fleet Connection magazines. Please click on the image to read the full article. For any more tips or a free, no obligation valuation of your house, flat, apartment or bungalow please give us a call on 01252 819725 or contact us. We can sell your property from as little as £599 or 0.5%+VAT, saving you thousands. Too late to get your property on the market before Christmas? Christmas is less than five weeks away. The decorations are in the shops and your shopping may already be in full swing. Buying a new property might be the last thing on your mind. But for others it might be a top priority. Traditionally December to mid January is a quiet time of year for the property market. However Boxing Day is said to be one of the busiest days for people looking at property online. People move house for all sorts of reasons such as a new job, a new addition to the family, people moving in together. These things can happen at any time of year. They don’t go on hold just because it is nearly Christmas. It can even be an advantage to go on the market at what can be seen as a quieter time. With less properties on the market yours can seem more desirable. Depending on your property, Christmas decorations can add real charm and a sense of celebration. They can help prospective buyers imagine just what it could be like to live in your property. We can get your house, flat, apartment or bungalow on the market in just 24 hours. We have even sold properties in less than 24 hours, thanks to our extensive database of buyers. We always offer honest valuations of what we think your property is genuinely worth. We take into account your personal circumstances, how motivated you are to move quickly, as well as market conditions. We work with you to provide a personal service from start to finish. Contact us for a free, no obligation valuation of your property on 01252 819725 or email info@check4houses.co.uk. We can sell your home from just £499 or 0.5% + VAT, giving you thousands more to spend on your new home. 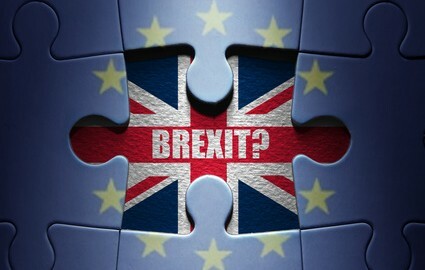 Could before the Brexit referendum be the best time to buy your next home? Since David Cameron announced the date for the Brexit referendum back in February, speculation has been rife about how the British people will vote. Campaigning is now well underway with both sides fighting hard to convince us what is right for Britain’s future. Membership of the EU has costs involved – but do they outweigh the benefits or not? What does a Britain outside of the EU look like and will it have the same global influence or not? One thing any political campaigning such as this can do is breed uncertainty. That can impact economic markets, including the property market. If people are unsure of what might happen in the coming months, they can decide to put off big decisions – including house purchases. That can actually make this the perfect time to buy your next property, especially if you are looking to upsize. With less buyers on the market, prices may come under pressure and deals can be had for motivated purchasers. First time buyers may also get lucky to secure a good deal and get their foot on the property ladder. If you are thinking of selling your property and buying your next home then we can help. With all the knowledge of a local high street agent, but at the cost of an online agent we can sell your property from as little as £499 or 0.5%+VAT, saving you thousands. Please give us a call on 01252 819725 or contact us and we can give you a free, no obligation valuation of your home. 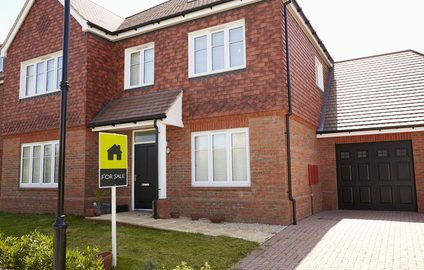 As part of a new initiative to boost competition and bring down bills for families the Government has said that it wants to encourage online only estate agents. The new Treasury paper, which will be followed by a consultation in the new year, includes a section headed “Injecting innovation into the process of home buying”. The text says: “The Government wants to inject innovation into the process of home buying, ensuring it is modernised and provides consumers with different – and potentially quicker, simpler and cheaper – ways to buy and sell a home. The paper also goes on to highlight the significant costs consumers incur from property transactions that fall through after money has been spent on legal fees and surveys, as well as express concern about the cost of legal services. The consultation will include evaluation of ways to make it “easier for businesses such as supermarkets and estate agents” to offer services such as conveyancing, probate and litigation and making the entire legal process “more transparent and efficient”. The paper, A Better Deal: Boosting competition to bring down bills for families and firms, is presented by Chancellor George Osborne and Business Secretary Sajid Javid. You can read the paper in more detail here. If you are thinking of selling your property then we can help. With all the knowledge of a local high street agent, but at the cost of an online agent we can sell your property from as little as £499 or 0.5%+VAT, saving you thousands. Please give us a call on 01252 819725 or contact us and we can give you a free, no obligation valuation of your home. Reading & Bracknell has topped the 2015 Good Growth for Cities index, produced by PwC and think-tank Demos. The report compares 39 cities across the UK, looking at various factors relating to economic success and family well-being. The success of Reading and Bracknell is down to a range of factors including high job security, high income and good levels of health. In contrast, London was ranked the third worst place to live out of the 39 cities included due to transport congestion, lack of affordable housing and long working hours, amongst other factors. The other cities that made the top five were Oxford, Edinburgh, Cambridge and Aberdeen. With Reading & Bracknell, these were the exact same top five cities as in the 2014 report – only the ordering has changed. This stability suggests that these cities are performing exceptionally well on both a short term and a longer term basis. You can read the full report, including discovering the ranking of your own city here. If you are thinking of buying or selling a property in Bracknell or its surrounding areas then we would be delighted to help. With all the knowledge of a local high street agent, but at the cost of an online agent we can sell your property from as little as £499 or 0.5%+VAT, saving you thousands. Please give us a call on 01252 819725 or contact us and we can give you a free, no obligation valuation of your home.